Keeping clean while in the woods isn't always an easy task, and this Paper Shower interview will tell you more about a new product that will make it easier. Learn how to keep clean and sanitary while camping, hiking or even in your car. A member of LoveToKnow Camping's editorial team was able to talk with Dr. Jim Bahcall about the Paper Shower, a unique and convenient product. Dr. Bahcall is a dentist who saw the need for a new product and instead of waiting for someone else to invent it, he decided to create it himself! Learn more about his simple yet innovative invention in the following Paper Shower interview. LoveToKnow (LTK): What exactly is a paper shower? Jim Bahcall (JB): Paper Shower is a unique wet and dry, two-towel sanitary hand, face and body wipe - the only of its kind on the market today. 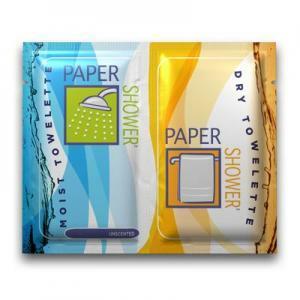 Paper Shower is a convenient, affordable and effective product for anyone looking to keep clean while on the go. A few examples of people that would benefit from Paper Shower include campers, outdoor enthusiasts, travelers, athletes and parents with young children. LTK: What motivated you to create this product? 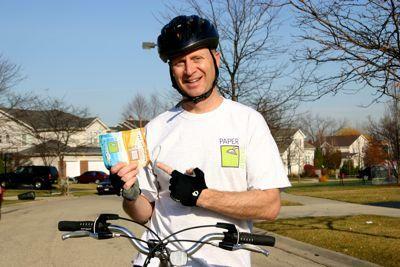 JB: Paper Shower was invented by me, Dr. Jim Bahcall, a dentist who is also an avid cyclist in my free time. I would carry instant hand sanitizer or wet wipes around in order to clean up after riding, but was frustrated that my hands and body were then wet. I wanted to have a package that included both a wet, soapy towel as well as a dry towel. Nothing like this existed on the market, so I created it. LTK: How is the Paper Shower useful for campers and hikers? JB: How many times have you been on a camping trip or outdoor event and all you had for keeping clean were hand sanitizers and wipes? Although they are useful, often times they leaves your hands and body wet after using them-now, for the first time, a new product gives you a dry towel with a wet wipe, all in the same convenient package. LTK: Is the Paper Shower biodegradable? LTK: Where can the Paper Shower be purchased and what does it retail for? JB: Paper Shower packets are affordable at $1 per packet. You can purchase multi-packs online. The more you buy, the more of a discount you can get. The product is available online at PaperShower.com. The company offers free shipping with any size order! To learn more about Paper Shower, visit PaperShower.com. There you can order as few as a six pack up to a 54 pack. These handy, unscented wipes will fit easily into a backpack, camper or glove box. Keep them everywhere! You will always have them handy to freshen up before a meal or after a long hike. LoveToKnow would like to thank Dr. Jim Bahcall for taking the time for this interview. We wish him much success in the future.